: Flushing and retrieving dog. Ideal for rough shooting or companion for the country dweller. Not suitable for city. 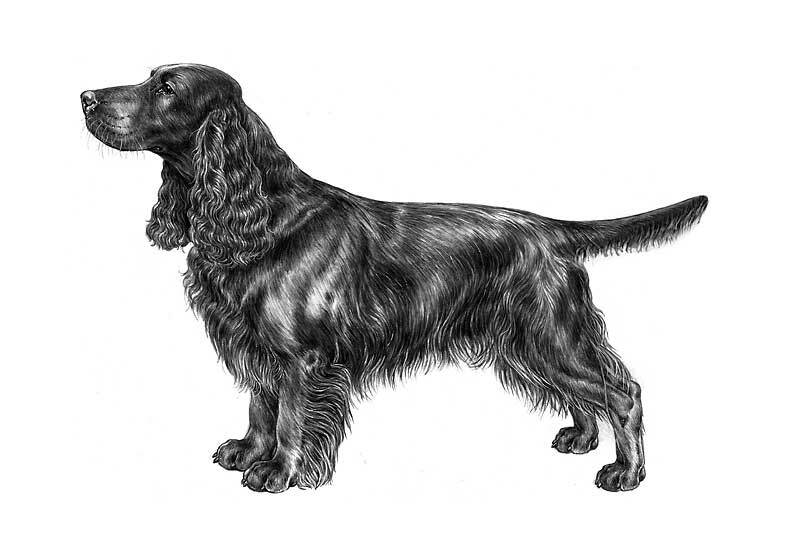 : Well balanced, noble, upstanding sporting Spaniel, built for activity and endurance. : Unusually docile, active, sensitive, independent. : Conveys the impression of high breeding, character and nobility. : Well chiselled, occiput well defined, lean beneath eyes. A thickness here gives coarseness to whole head. Slightly raised eyebrows. : Well developed with good open nostrils. : Long and lean, neither snipy nor squarely cut. In profile curving gradually from nose to throat. : Wide open but almond-shaped with tight lids showing no haw. Grave and gentle expression. Dark hazel in colour. : Moderately long and wide, set low and well feathered. : Long, strong and muscular enabling dog to retrieve his game without undue fatigue. : Back and loin: Strong, level and muscular. : Deep and well developed. Ribs moderately well sprung. Length of rib cage is two-thirds of the body length. : Previously customarily docked. Set on low. Never carried above level of back. Nicely feathered, with lively action. Docked: Docked by one third. Undocked: Reaches approximately to the hocks. Of moderate length in balance with the rest of the dog. : Legs of moderate length. Straight, flat bone. : Long and sloping and well laid back. : Tight, round with strong pads and not too small. : Long, unhurried stride with great drive from the rear. Short, stumping action undesirable. : Long, flat, glossy and silky in texture. Never curly, short or wiry. Dense and weatherproof. Abundant feathering on chest, under body and behind legs, but clean from hock to ground. : Black, liver or roan. Any one of these with tan markings. In self-coloured dogs white or roan on chest permissible. Clear black/ white or liver/ white unacceptable. : Approximately 45.7 cm (18 ins ) at the withers. : Between 18-25 kg (40-55 lbs).